The Ultra Thin Air case that Spigen SGP creates for almost all of the newly released flagship phones has always been one of my favorites. As someone who favors minimal cases that don’t add extra bulk, this is one of the two that I always turn to (Rearth’s Ringke SLIM being the other) for testing. Now that their Nexus 4 Ultra Thin Air is available in black, I thought we’d take a quick look at it, since many of you seem to be fans of the minimal case as well. As you would expect with a name like “Ultra Thin Air,” this case adds almost zero thickness or bulk. It’s incredibly thin, and also lays almost flush with the sides of the device so that you can come close to getting that same waterfalling feel on the edges when swiping your finger across it. The corners stick up ever-so-slightly so that when laid face down, there is a bit of a lift off the ground to prevent scratching. The material is plastic with a soft matte finish. It’s not slippery, yet also not super sticky. Wireless charging still works through this case, though it can be a bit finicky, something that shouldn’t surprise anyone with a Nexus 4. So how does it compare to the Ringke SLIM we looked at? It’s a tough battle. The Ringke case sticks up a bit more in the corners to offer more protection, but both should do the trick for those who choose to lay their phones face down. 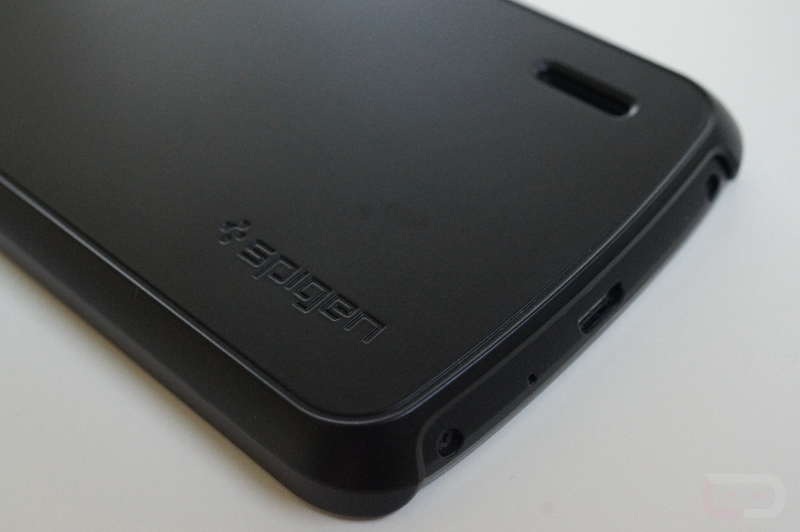 The Spigen case, which seems impossible, is actually slightly more minimal. It comes up slightly less on the sides, but I believe this also makes it not grip the device as well as the Ringke. I don’t think the Spigen case will fall off of your Nexus 4 without some work, but it’s definitely easier to slip on and off than the Ringke. Something to keep in mind. The Ringke case also comes in a variety of colors – the Ultra Thin Air is only available in black at this time. In a price battle, you’ll find the Ringke at $9.99 and the Spigen at $19.99, but keep in mind that the Spigen case also comes with a cleaning cloth and a screen protector (valued at $14). Tough decision, but both are really nice minimal cases.